The theme of the residency was Connect with Your Nature . This theme arose from the work of the ACT Parks and Conservation Service. They are promoting nature’s contribution to maintaining and nourishing human bodies and minds, while protecting and conserving the natural assets of the Namadgi National Park. Ruth describes her residency as Namadgi Mindfulness . 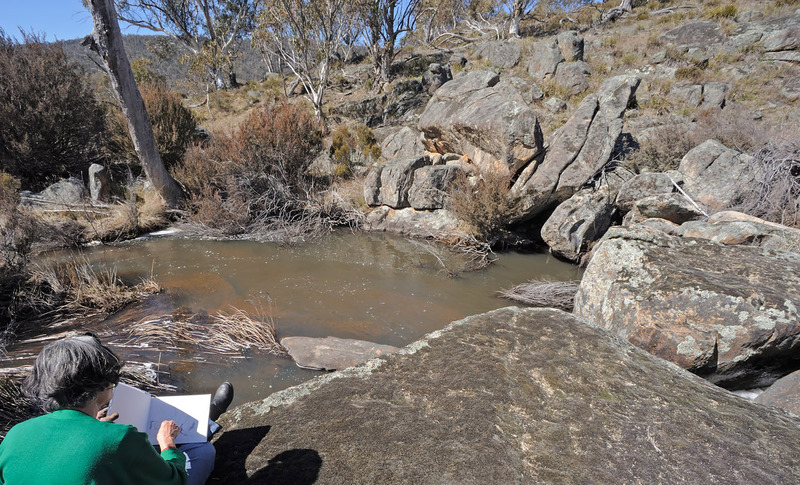 She used this dedicated time to engage mindfully with the natural bushland in the Namadgi National Park in order to produce a body of new work. She continues her explorations of the ways people respond to particular landscapes. As Ruth explains it, People create their dwellings and arrange their activities in response to their immediate natural environment and this, in turn, lays new textures and patterns on the landscape, which become material for my work. The Artist-in-Residence program is presented by Craft ACT in partnership with ACT Parks and Conservation Service. It is supported by artsACT through the Arts Residencies ACT initiative. In 2015 the program is partnered by the National Archives of Australia, offering a formal research period for each artist to compliment their residency.